Found in FNA Volume 9. Treatment on page 315. Mentioned on page 314, 316. Herbs, 3–11 dm. Roots: tubers ± narrowly oblong, thickened. Stems with short-stipitate-glandular hairs and pubescent to villous and hirsute (hairs scattered, erect, 3–4 mm, stiff). Leaves: mid cauline stipules ± falcate to ± 1/2-round, margins deeply incised; major leaflets 3–9 (mid cauline 5–7), minor 0 or 1 pair; major leaflet blades obovate to elliptic, terminal largest, largest of these 2.9–7 × 1.7–3.7 cm, margins serrate to dentate, apex obtuse to acute, abaxial surface rarely with glistening sessile-glandular hairs and pubescent to pilose and hirsute (hairs stiff, scattered, 1–2 mm, densest along major veins). Inflorescences: axes pubescent to villous and hirsute (hairs stiff proximally, erect and 2 mm to ascending distally and 1 mm). Flowers usually ± alternate. Fruiting hypanthia turbinate to obconic, 2.2–4 × 3–4.6 mm, ± deeply sulcate, hooked bristles in 3 circumferential rows, proximal row spreading 45–90°, glandular-hairy (hairs short-stipitate), grooves strigose, ridges rarely sparsely hirsute (sepal bases rarely pubescent along rim). Ala., Ark., Fla., Ga., La., Miss., N.J., N.C., Ohio, Okla., Pa., S.C., Tenn., Tex., Va., W.Va. The ranges of Agrimonia microcarpa and A. pubescens overlap from North Carolina through Arkansas. Only rarely do populations of either species occur in the range of the other species beyond that contact area. Plants occurring within the range of A. pubescens that resemble A. microcarpa but lack one or more of the above characteristics have been included in A. pubescens. 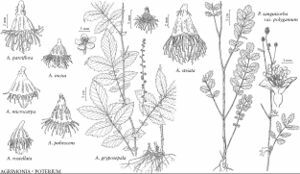 Observations of plants of A. pubescens grown from seed in the garden at Northern Illinois University suggest that some, if not most, plants resembling A. microcarpa are young second-year plants or are under stress. Ambiguous identifications are most clearly resolved when mature fruits are present.